Below is the speech I gave this evening at the opening ceremony of our school year. Good evening. For those of you who don’t know me yet, my name is Sarah Edson. This is my fifth year at Walker’s, and I am an educator, advisor, and the Dean of Academic Technology here. If you’re wondering what that title means, it means I help the school to figure out the awesomely creative uses of apps and the Web to make teaching and learning even better. It also means that I remind students as often as it takes that SnapChats don’t actually disappear. They don’t. (And not just with screenshots.) If you’re in Ninth Grade Seminar, I’ll show you. Hey, even if you’re not in the ninth grade, I’ll show you. And the offer extends to teachers, as well... you SnapChat troublemakers. So, SnapChats don’t disappear. Consider this your first of many reminders. Anyway, it is great to see you and to join you in kicking off a new year. Now, I know there are a lot of mixed feelings about being back in school. Some of you have become bored and a little bit stir-crazy as of late, you’ve been driving your families nuts, and you are psyched to be back with the people with whom you’re going to have so much fun this year. Others of you, I know for a fact, are utterly bummed that summer is over. You can’t stop tweeting about it either. After all, what’s there not to love about summer vacation… when every day is a dress-down day and sleep-ins are often the norm. It’s hard to beat that. But we’re here. And, whether you’re feeling it or not right now, it’s a good thing. Some who know me know that I suffer from ridiculous stage fright. Really. Irrational, hands-shaking, completely senseless stage fright. In fact, when Mr. Brock suggested that I speak to you all of you, I wanted to sit him down and say, “Stephen. Brock. Dunn. What are you doing to me? I thought you were my friend. I will get you back for this.” [I kid, of course... This is an honor.] But I’ve always had this annoying phobia. Growing up, I studied classical ballet pretty seriously. (I know, ballet is a genius pick for someone with incurable stage fright...) From the ages of 5-18, my parents generously drove me into the Boston Ballet studios for lessons 5-6 days a week. I worked hard. But come performance time, like clockwork… I would pace. I’d get light-headed. And no matter how many practice hours I’d put in, I would be riddled with self-doubt. But my mom did something quite brilliant, though incredibly simple. Like many parents, for my performances, she and my dad were nice enough to get me flowers. And always my favorite: peach-colored roses. But my mom, quite deliberately, would give me my flowers first. Hours or even days before I performed. Because she wanted me to know that no matter what happened out on the stage -- whether I nailed the choreography or fell flat on my behind, she was proud. Proud of my willingness to take on a challenge and face my fears. And, regardless of what took place, after I finished, she’d be on her feet clapping louder than anyone (even if no one else was clapping). And you know what? It worked. Every time. Knowing that I had that unconditional immovable support -- that put me at ease, which of course… helped me to perform even better. Simple. Brilliant. That was my mom. I still think of that smart, caring move on her part and its impact to this day. Flowers first. Tell her before how proud you are. And when stage fright creeps in again, even now, I also remember to keep things in perspective and not to take myself too seriously. For example, some of you have seen two framed black-and-white photos I keep in my office of my mom giving the speech of her life at the tender age of 17. 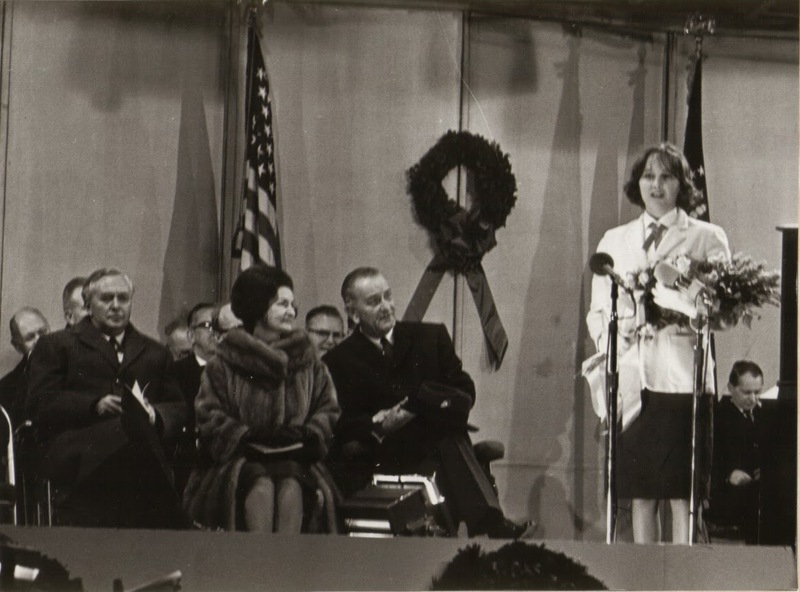 She was called to speak about the promise and potential of young women in Washington D.C. in front of then President Lyndon Johnson, First Lady Ladybird Johnson, and the Prime Minister of Great Britain, Harold Wilson. … No big deal. Just your everyday, average audience. Combatting her own stage fright, she stood there, with unmistakable poise and grace, and she knocked the speech out of the ballpark. 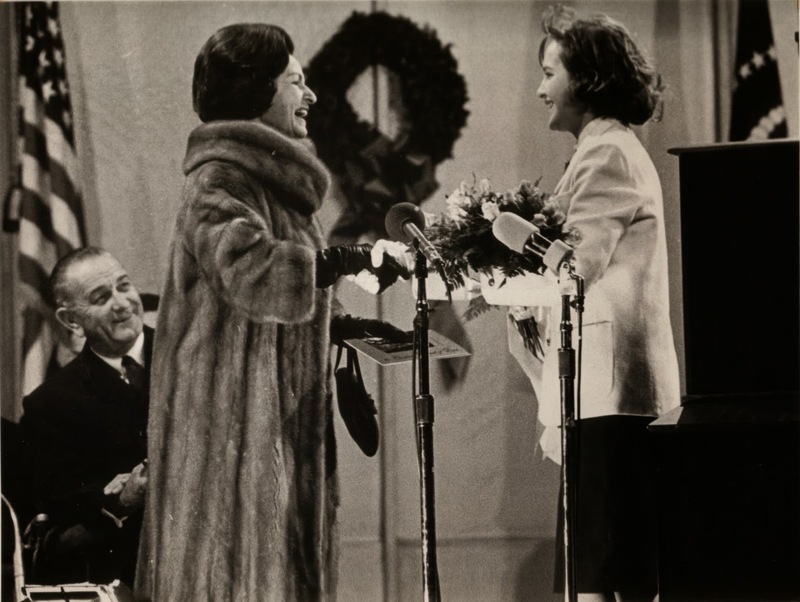 In fact, my mom’s speech had such an impact, after she finished, as President Johnson escorted her back to her seat, he leaned in and said to her, “I wish you could write all my speeches.” The President of the United States said that to her. When she was 17. Not a bad confidence boost. I don’t know for sure, but I would put money on the fact that her parents, my grandparents, let her know beforehand just how proud they were. As the year gets underway and challenges arise, and they surely will -- in the classroom, on the fields, in the studios, on Dogswood Day, anywhere in your lives, remind yourself that you have what it takes to face those challenges. You do. And, no matter what happens, you will never be without support from all of us. Before, during, and after. So, to everyone, from the class of 2020 to this year’s senior class of 2014… Have a great year. Good luck. Make us proud. But more importantly, know that you already have.